Evergreen is a tight-knit, accepting community and a gorgeous place to live, with easy access to Greater Denver as well as the central mountain ski areas. Open spaces such as Alderfer/Three Sisters Park and Elk Meadow allow endless miles of hiking or mountain biking, and Evergreen Lake is the center of many community celebrations as well as summer boating and winter ice skating. But while the attractions of big-city Denver are plentiful and well-known, the Evergreen area offers its own culture, arts and entertainment, which make it a fun place to visit and a rich place to call home. As you travel up from Denver or Golden on I-70, you will first pass Dinosaur Ridge, at the base of the foothills in Morrison just off I-470. On this site in 1877, Jurassic-era dinosaur bones were discovered, and subsequent excavations led to the unearthing of more than 300 dinosaur tracks and bones embedded in the rocks. You can hike the mile-long trail and see actual dinosaur fossils that date back to the time when Colorado was a flat lowland with freshwater lakes and streams, nearly 100 million years ago! Dinosaur Ridge also offers summer camps for children, with a variety of archeological and paleontological activities. The nearby Morrison Natural History Museum also allows visitors to explore the wildlife, plants and fossils of the area. 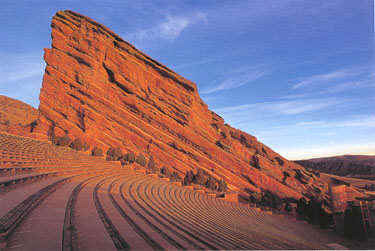 Also in Morrison is the famed Red Rocks Amphitheater, which was modeled on ancient Greek outdoor theaters and carved into the stunning 400-foot sandstone formations. The natural acoustics, the views of Denver, and the beauty of the site make it a world-renowned concert venue, hosting concerts of all genres throughout the summer season. Red Rocks also hosts summer movie nights, an Easter sunrise service, and numerous high school graduations. The surrounding land is a park with trails, picnic areas, and more geological points of interest. Intrepid runners and fitness buffs also use the long, steep steps of the amphitheater for training! On the north side of I-70 you will pass Heritage Square, a small amusement park that was built to resemble an 1880’s Victorian western town. The shops, restaurants and music hall are open throughout the year, but the most fun parts are the children’s rides, train, and the half-mile alpine slide, which locals and out-of-towners flock to in the summer. On the way up the hill, you will see signs for the Mother Cabrini Shrine and the Boettcher Mansion. The shrine site was originally founded by Mother Cabrini as a summer camp for orphans, but was converted to a shrine when the nun was canonized in 1946. A white alabaster statue of the Sacred Heart of Jesus crowns the spot, overlooking the hills and the city below, and serves as a peaceful reflection spot. The Boettcher Mansion was built in 1917 as part of the new simplistic style of architecture, in rebellion against the Victorian ornateness that had dominated up until that time. The builders used natural materials, a clean layout, and natural landscaping of wildflowers and native plants, and the mansion is a lovely place to visit or for special events. If museums are more your style, the Buffalo Bill Museum and Grave sit on Lookout Mountain, and give you a chance to revisit the wild west and explore the life of pony express rider/buffalo hunter/showman Buffalo Bill Cody. Evergreen itself offers the International Bell Museum with over 6,000 working bells, some dating back to 1000 BC, and the Hiwan Homestead Museum, a pioneer era ranch built by Dr. Josepha Douglas, one of Colorado’s first female doctors, in the 1890s. The Evergreen area offers a huge variety of antique stores, bookstores, galleries, and wellness centers such as yoga studios, massage studios, and spas. Evergreen is also home to the Evergreen Chamber Orchestra, the Evergreen Children’s Chorale, the Evergreen Chorale, the Mountain Community Handbell Coalition, and the Evergreen Players. Nearby Conifer also has two theater companies, and Morrison has a theater troupe and children’s acting workshop. Finally, music lovers who aren’t at Red Rocks are usually found at the Little Bear in historic downtown Evergreen. On any night of the week you will find live music at the Bear, from local bands to national acts (Willie Nelson and Fleetwood Mac have played there in the past!). The joint is always jumping, and the ambiance…a world-famous dive bar with dancing, pool tables, burgers and pizza, and creative décor all in a historic building…can’t be beat. If you enjoy live music be sure to check out the Evergreen Lake Concert Schedule for showtimes. There is a concert at the Evergreen Lake house every other Wednesday in the summer. It is a fantastic venue with local live bands and it’s free. You are welcome to bring food and drinks. They also have food venders. you can’t buy alcoholic beverages but you are welcome to bring you own. Any visitor to the Greater Evergreen area will agree that one does not need to travel “down the hill” to Denver to have a good time!